For a recent consulting project we did evaluate the messaging and social media accounts of the big cloud providers (Amazon AWS, Google App Engine, Microsoft Azure) and discovered the relatively new service Amazon Lightsail (launched in December 2016). Lightsail targets a less tech savvy audience than the typical Amazon cloud customer and offers a fixed priced product. As freshvanroot.com is hosted on GoDaddy and we wanna move away from there (for a long time already, but never found the time to do so..) we thought why not evaluate Amazon’s new offering, our website could be a good fit for the new offering. I evaluated AWS two years back for hosting WordPress, but immediately got the impression that this is way too​ technical for me and I better stick to a classic shared hosting plan. I was overwhelmed by the list of services, features, products, configuration options and so on. So I stopped right in the trial period again. For evaluation projects it always best to work with a real world usecase, so we decided to host our years special page on Amazon Lightsail. You can check it out at deep.freshvanroot.com. So here are my findings, from a non techie perspective with little AWS experience. As expected easy: You can use the same account as for ordering your stuff from Amazon, which seems a bit weird having all the shopping data tied to the same account running your website. Creating your WordPress site is very straightforward. Amazon is featuring pre-configured Bitnami images you can launch with one click. You select the app, click launch and you are done. At each step documentation for the potential next steps is shown. Before launching the app you choose the pricing. This is one of the main benefits when choosing Amazon Lightsail: It takes away the risk of not knowing of what to pay at the end of the month. Cloud pricing can be a bit hard to guess, especially as a newbie. Take a look at the “simple” monthly calculator from Amazon or Azure. The pricing is per instance, so if your plan is to create multiple WordPress sites you have to choose a plan per instance. Changing instances is easy: You save a snapshot of the instance, stop and delete it. After that you can create a new instance based on the snapshot. 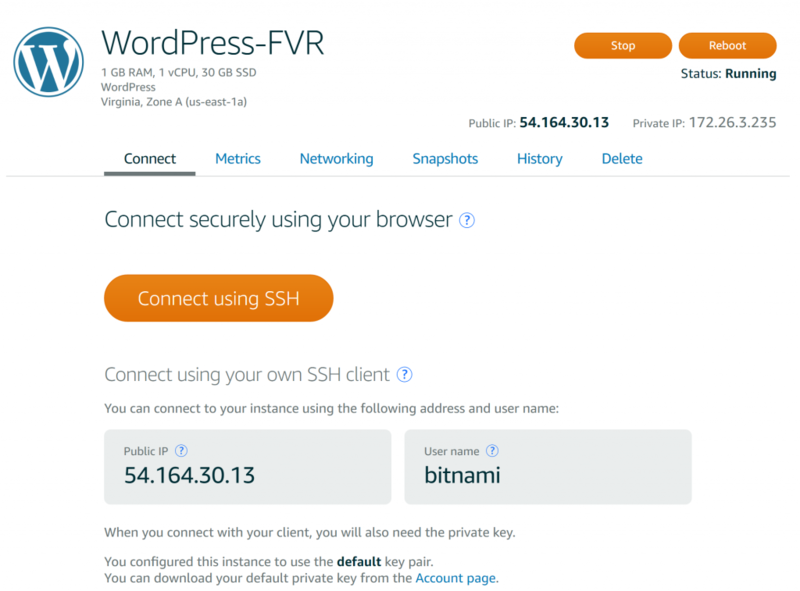 I am not used to connect to a virtual private server via SSH. But with the documentation provided from Amazon and Bitnami I was able to execute a few commands to remove the Bitnami banner shown per default at the bottom right corner and point the subdomain to my WordPress instance at Amazon. You can browse the Amazon Lightsail docs to get a feel of what is easy to accomplish. One thing I really enjoy with a local hoster like all-inkl is that you have phone support, even for shared hosting plans. When something goes wrong I can pick up the phone and ask for help (or get a hint of what’s going wrong). I did not expect to have any support from Amazon when running WordPress on a 10 $ per month offering, but it turned out that I do. I created the ticket and got feedback within 24hours. That is not anywhere near the typical 1-2 hours email support from my local hoster, but it was not a time critical issue. But imagine you have a downtime caused by mis-configuration in your account and your site goes offline – you are on your own! You would need an expert on hand to help you out. Lightsail is very simplified version of AWS and launching a WordPress site is done within in 2 minutes. Once you configured your site you very likely will not touch the underlying technology. If your traffic grows and you can simply move your virtual private server to the next level and get a better performance. While I am not an expert on that matter I can say that the big difference to my local shared hosting is performance: Browsing the WordPress dashboard, uploading pictures, editing content – it is all super fast, even on the $10 plan. If you have a fitting project at hand, yes. Most of the tools you use as a digital marketer already run in the cloud, building the knowledge of how to run WordPress on cloud services like Amazon, Azure or Google is a good start to make yourself aware of all the other services the big cloud providers offer. If you are used to FTPing into your shared hosting and editing a config file in your WordPress folder you will be able to master running WordPress on Amazon Lightsail. Hey Rolf, I was really interested in knowing your opinion about how managed cloud solutions like Cloudways and WPEngine fare against Amazon Lightsail. The process that you described is very similar* to what Cloudways offers when it hosts your wordpress website on AWS. So what’s the difference really? Should I start using Amazon Lightsail instead of Cloudways? Hi Gwyneth, sorry for replying late .. and also not having an answer to your question. I never used WPengine or Cloudways. One more comment on Amazon Lightsail – using it nor for over 6 month and not having any problems in managing it as a non techie, also support time was very reasonable. Yes, I have taken the page offline! I would google around, it is not as easy as with a shared hosting where you just copy/paste FTP information, needs some config but doable.